8. 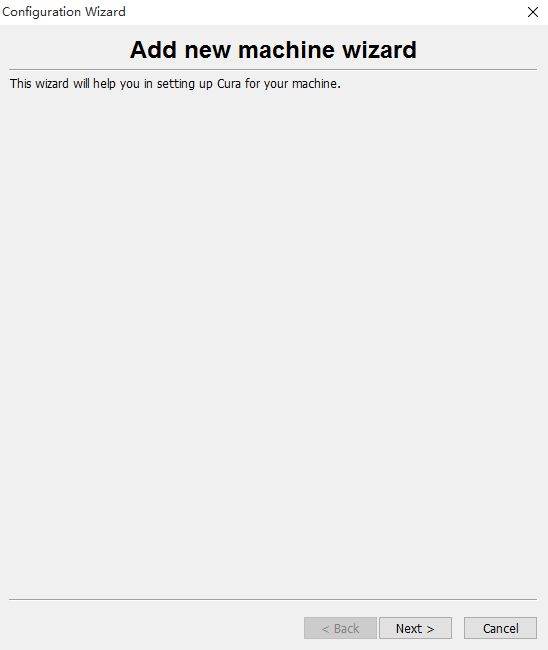 Press OK button to wake up OverLord, and enter “Print” to choose the printable .gcode file. Once above steps are completed, the printer starts to heat up the nozzle (and the buildplate, if available). OverLord starts to print automatically after the nozzle heats up completely. A printing progress bar will appear on the screen to show the estimated printing time. The nozzle returns to its home position again when printing finishes. Please wait until the nozzle temperature cools down to room temperature (approximately 10~15 min). Then carefully remove the print object from the buildplate with a scraper. During printing, some of you may need further adjustment on print settings. Then you can try “Tune” function. Speed Printing speed; 100% by default. Adjust it by pressing “↑” or “↓”. Temperature Temperature of nozzle. It should be set to different default values based on the different printing materials. Adjust it by pressing “↑” or “↓”. Build plate Temp Temperature of build plate. It should be set to different default values based on the different printing materials. Adjust it by pressing “↑” or “↓”. Fan speed Fan speed is set to 100% by default. 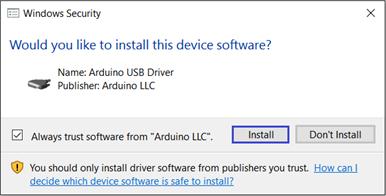 Adjust it by pressing “↑” or “↓”. Material flow Material extrude/flow rate; set to 100% by default. Adjust it by pressing “↑” or “↓”. You can pause OverLord during printing and resume the print next time you turn on the machine. Once paused, the printer will save printing progress data, and the screen will display “Pausing”. The saving finishes when “Pausing” disappears. When you enter print file menu next time, OverLord will prompt you and ask whether you want to resume the unfinished task from last time. Press “OK” to confirm auto-resume. You may also choose “manually set the height” if you want the printing starts from a new customized layer. 1. Press “↑” and “↓” on the main menu and select “Reload”. 2. Wait until the print nozzle is fully preheated. 3. After the heating is done, select “Continue” to auto-remove the material. If there is no material inside the printer, please “Skip” this step. 4. The extruder is reversing material. Upon finishing, fish out and remove the material from the extruder and take the spool of filament out. 5. Thread the filament end through holes on the plastic spool to avoid filament disordering and overlapping. Then seal the spool of filament inside a plastic bag to conserve the material. 6. After removing the material, select “Ready” to move on to the next step. You can also press “Cancel” to stop the entire process. 7. Please prepare a new spool of material, make sure the head is sharp. Then insert it and PUSH it into extruder tube until you feel the filament is held by the extruder and moves automatically. 8. Finally, use your hands to put the spool right in place. 9. Select “Ready”. The material will automatically be fed into the nozzle. 10. The material will exit the nozzle when the material feeding process is complete. Select “Ready” to proceed to material settings. If you change the material when OverLord is paused, please take care of your printed object, and do not let this waste material destroy your printed object. 11. The last step is to set what material you loaded, for instance “PLA”. Press “OK” to return to main menu. You can tell the filament is successfully loaded if you can see the material exit from the nozzle when the material feeding process (step 10) is complete. 1. If you cannot see the material coming out from the nozzle on the last step, while you can hear regular abnormal sound from the extruder, it means the filament reload is unsuccessful. 2. Wherever it stops, universally you can run “Reload” again to remove and reload the filament again to see if it is successful. This time, remember to (1) cut the end of filament in 45 degree to make it sharp and (2) make the end more straight before load it into the printer. 3. However, if “try it again” doesn’t work, the next thing to do is to figure out where the filament stops. In different situation, you may use different methods. a. If the filament stops in the extruder, you will see there is no filament in the extruder exit tube. 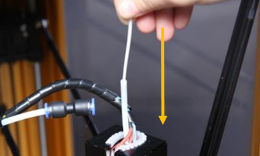 Try disassemble the extruder (link to FAQ–maintenance–Removing the broken filament inside extruder) to clear out the feeding path in case any filament residue left inside. b. If the filament stops in the black bi-pass pneumatic fitting structure, your will see there is not filament in the pneumatic fitting exit feeding tube. 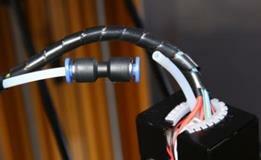 Then you can fix it in this way: push the blue circle (some are black) under the pneumatic fitting. While pushing, you are able to drag out the feeding tube which connects the nozzle and the pneumatic fitting. Then use a spring knife to chamfer a little bit the inner wall of the tube. Reassemble it back and you can try reloading again now. Build plate calibration, or leveling, is a very important and fundamental step before starting any print. Build plate calibration ensures the printer knows where the build plate is, so that it can lay down the first layer of printing in its correct place. Build plate calibration directly affects the print result and is thus extremely important. What will happen if the 3D printer is not well-calibrated? 1. If the nozzle is too near to the buildplate, there is no space for the first layer of material to be printed on. In this case, if not re-calibrate again, your nozzle may gradually worn out heavily and get blocked in the end. 2. If the nozzle is too far away from the buildplate, the nozzle cannot give the first layer of material constant pressure to push it stick on the buildplate. The first layer can become seriously wrapped or even detached from the buildplate. It is true that sometimes wrapping is normal and cannot be eliminated when you print larger models or use material with high shrinkage ability. But if your machine failed to be calibrated well, even small printed objects made of PLA may easily get wrapped. In this case, your prints will easily fail because gradually the printed object cannot stick to the buildplate and lost its original position. 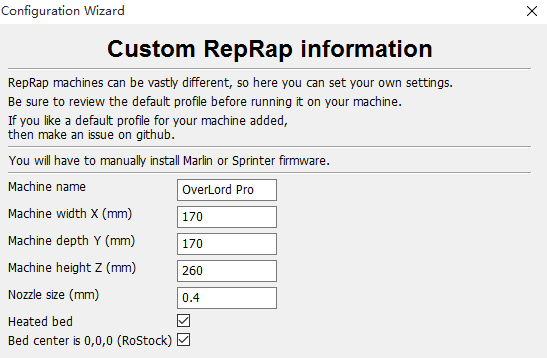 In the start-up program of OverLord, the build plate has already been calibrated automatically, which removes the need to calibrate over and over again before printing. However, after a number of prints, if you find the printer is not extruding at the first layer or the first layer is not sticking to the buildplate well enough, you may need to calibrate the machine again. OverLord provides you with a smart auto-calibration method, which reduces the process to a single press of a button. This will also correct against constant printing failure caused by the un-leveled plate. 1. 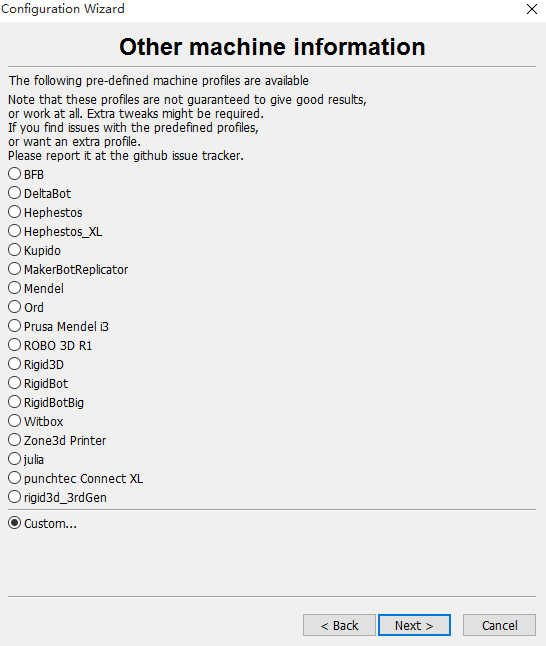 Select “Calibrate” in the main menu to start the build plate calibration program. You could choose either AUTO or MANUAL to finish the calibration process. 2. 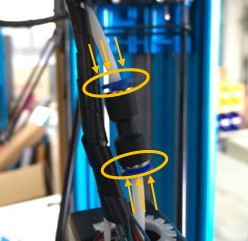 If you select “Automatically level the build plate”, the nozzle will automatically begin to carry out the calibration process until it is completed. It will return to the main menu after calibration has finished. 3. Sometimes choose “manually level” may give you a refined calibration result. You can enter manually level interface by rejecting “Automatically level” and then selecting “Manually level”. While manually level the buildplate, please make sure OverLord has material already loaded inside. Follow the steps shown on screen. When the printer starts printing circles on the build plate, press ↑　or ↓ to lift or lower the nozzle, till the printer could print an entire circle on the build plate. The circle could be seen obviously and should be adhere firmly on the build plate. When OverLord could print a fine circle, Press “OK” to finish the calibration. Why sometimes we need clean the nozzle? The nozzle can over time become blocked by dirt, carbonized material or material properties changes caused by material mixing during material changing. This often happens gradually: first, porous structures will start to appear on surface of the print object, and if left unaddressed, it then worsens to the point that your nozzle becomes completely blocked and nothing comes out. If you do not clean your nozzle in a prompt manner, the quality of printing will become continually deteriorate. The best way to protect nozzle from blocking is to use good quality filament and avoid changing the filament too frequently. When you find your print is under extrusion, it’s recommended to run the in-build “Clean” function to clean the nozzle at early stage. 3. 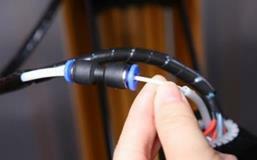 Open the filament tube above the nozzle by hand. You will find above the nozzle, there is a black bi-pass pneumatic fitting structure. On its ends, there are two blue clamps. Push the clamps to the bottom to loosen the clamp. Meanwhile drag out the filament feeding tube as hard as you can. In this way, it is easier to reach the blocked nozzle end through the short tube above nozzle. If you failed to unload filament in step 2, now you are able to reach the filament inside the tube, and in step 5, when the nozzle heats up to 220℃, you can drag the filament out by hand. 5. Follow the prompt of printer, after it heats up to 220℃, insert the filament directly to the nozzle. Push hardly down until you can see melted filament is coming out of the nozzle end. Leave the filament inside nozzle and select “OK”. 6. Then the nozzle temperature will lower to 90℃, wait until printer gives you the next prompt. 7. After the nozzle temperature reaches 90℃, printer will show a message and let you slowly pull the filament out from the nozzle. The dirt or carbonized material which stuck the nozzle end will be dragged out together with the filament you are pulling out. Then cut off the melted and dirty filament end. 9. After cleaning the nozzle, assemble back the tube, push it until it cannot move forward anymore, then you can reload the filament and start printing again. If this method do not help, please go trouble shooting to try another method (link to FAQ-Maintenance–Clean the nozzle of E3D). The setting of nozzle temperature is created not only to check the heating function of OverLord nozzle, but it also helps you when you manually clean the nozzle. In order not to block the nozzle, the nozzle target temperature will fell to 0 degree once you’ve left the nozzle temperature setting page. However the build temperature won’t. You can use this feature to pre-set the buildplate temperature when the room temperature is low and you want to shorten the time of heating preparation before printing. The setting of fan speed is created to check if the fan operates normally. Move material allows you insert or remove filament manually. 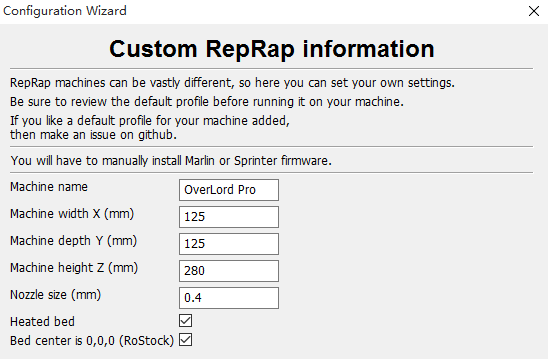 This feature helps you when you failed to reload the filament but you do not want to completely run the “Reload” program again. In addition, this feature can help clean the nozzle when the nozzle is not seriously blocked. You can manually extrude material for a long time and eventually, if the nozzle is not seriously blocked, the dirt inside nozzle can flow out with the melted material. The material settings are usually recommend by your material supplier. OverLord can reach up to 260 ℃ of nozzle temperature and about 90℃ to buildplate temperature. 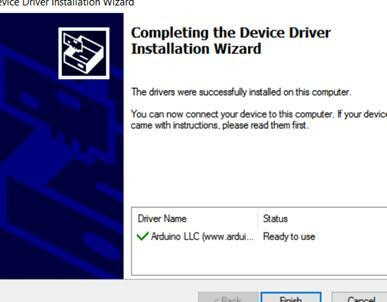 Usually after you installed a new firmware, you need to do factory reset to ensure the new firmware settings are completely applied. You can know the lifetime, print time and how much material has been printed by checking the machine state. Different model has different settings, please strictly follow instruction of each. Layer height (mm): The height of each layer. For print quality and printing time this is the most important setting. Usual settings are 0.2mm for a fast but low quality print; 0.1mm for a high quality but slow print; and 0.15mm for a medium quality print with medium print time. Shell thickness (mm): The thickness of the side shells, when printing a simple cube, this is the thickness of the side walls. Increasing it improves the strength of the part. Usually it is integer multiple of nozzle diameter. For OverLord (Pro), shell thickness should be 0.4mm or 0.8mm or above. For OverLord (Pro) Plus, shell thickness should be 0.5mm or 1.0mm or above. Enable retraction: Retraction is pulling the filament back when moving over a gap in the print. This reduces the amount of thin lines between printed parts. These thin lines are called strings. Retraction is usually always enabled, unless you want to print faster or are printing with a material that does not allow retraction. Retraction length: The amount of mm the filament is pulled back when a retraction happens. 6mm gives good results on almost all OverLord with PLA. Other materials might need different retraction settings. Retract speed: The speed at which the filament is pulled back when the printerhead needs to move over holes. OverLord recommend 80mm/s for PLA. Recover speed: The speed at which the filament is pushed back after retraction. OverLord recommend 80mm/s for PLA. Initial layer thickness (mm): The thickness of the first layer. This first layer should set to 0.2mm for OverLord series. Initial layer line width (%): Extra width factor for the extrusion on the first layer, on some printers it’s good to have wider extrusion on the first layer to get better bed adhesion. 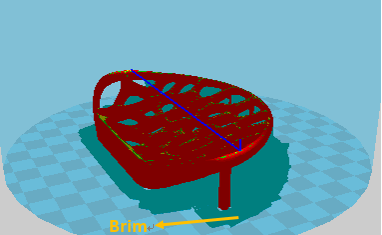 Cut off object bottom (mm): Cut the bottom of the model, this effectively sinks the object into the printer bed. 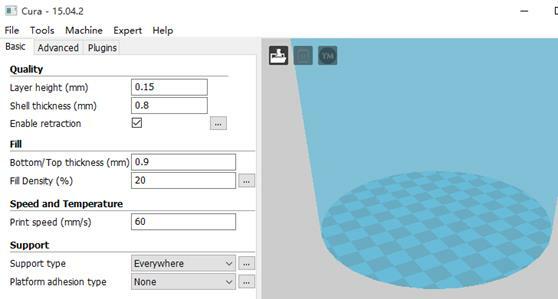 If your object does not have a lot of contact area with the printer bed then this feature could help you. Bottom/Top thickness (mm): The bottom/top thickness is the outer shell thickness on the top and bottom. For example, when printing a simple cube, this is the bottom square and top square thickness that are put down. Increasing this will make a stronger part, and depending on your model, it will make for better solid tops. 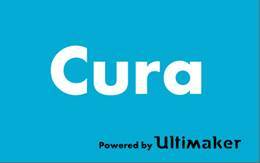 Fill Density (%):Cura fills the internal parts of your model with a structure. This grid is made for strength and to support the top layers. The amount of infill you want is influenced by this setting. More infill produces stronger parts that take longer to print. If strength is not a requirement then this setting could be put on 5% for a low density infill that can still support the upper layers. Print speed (mm/s): Print speed sets the speed at which the print is put down. The default of 50mm per second is a bit low for an OverLord. But this is a safe starting point. People have printed up to speeds of 120mm per second. But this requires a well calibrated and tuned machine. We usually recommend speed of 60mm per second. Travel speed (mm/s): The speed at which the printhead moves when it is not printing. The OverLord is set on 120mm/s as recommended. It is not uncommon for a printer to achieve 150mm/s or 200mm/s travel speed. But if you are seeing shifts in your print then the travel speed might be the cause. Bottom layer speed (mm/s): The speed at which the print head moves while it is laying down the first layer. This is done to make the print stick easier. Infill speed (mm/s): The speed at which infill lines are printed. If set to zero then same speed is used as for the rest of the print. A slight loss in outer quality can be expected if you use this to print a fast infill due to changes in nozzle pressure when switching between outside and infill parts. Top/bottom speed (mm/s): Speed that top/bottom parts are printed. If set to zero then the print speed is used for the infill. Printing the top/bottom faster can greatly reduce printing time, but this can negatively affect print quality. Outer shell speed (mm/s): Speed at which outer shell is printed. If set to zero then the print speed is used. Printing the outer shell at a lower speed improves the final skin quality. However, having a large difference between the inner shell speed and the outer shell speed will affect quality in a negative way. Inner shell speed (mm/s): Speed at which inner shells are printed. If set to zero then the print speed is used. Printing the inner shell faster than the outer shell will reduce printing time. It is good to set this somewhere in between the outer shell speed and the infill/printing speed. Minimal layer time (sec): The minimal time spend on printing a single layer. If a layer takes less time to print then this configured time, then the layer is slowed down. This ensures that a layer is cooled down and solid enough before the next one is put on top. Enable cooling fan: The cooling fan is usually enabled and greatly improves print quality for PLA. For some other materials you might not want to use the cooling fan at all and this setting will disable it. 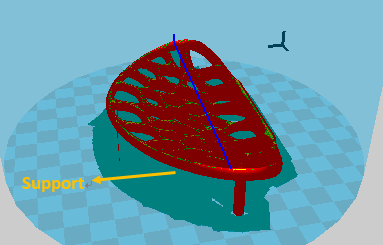 Support type (None/touching buildplate/Everywhere): Supports are structures printed below the print object to support parts that otherwise would be unprintable. There are 2 options, support structures that need to touch the build platform, or support structures that can also touch the top of your model. Platform adhesion type (None/Brim/Raft): Platform adhesion type is a setting to help the printed object stick on the printer bed. 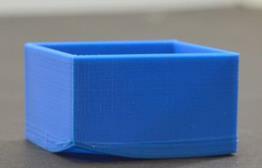 Large flat objects might get lose from the printer bed because of an effect called warping (curled up corners in the print). There is the option to use a raft, which is a thick grid under the object which scars the bottom of your print. Or a brim, which are lines around the bottom of your object and because of the larger area the corners are kept down. Brim usually gives the best results as it does not scar the object. But it requires more space on the printer bed. Nozzle size (mm): The size of the hole in your nozzle. The OverLord (Pro) comes with a 0.4mm nozzle by default. And OverLord (Pro) Plus comes with a 0.5mm nozzle by default. Some people drill the nozzle to 0.6 or 0.8mm for faster printing at lower quality. There are more useful settings in the expert config section.